The Great Blue Heron - The Central Coast of California is rich in wild birds and the Heron is one of the most spectacular bird in the world. The pictures you will see on this page where taken on the East/West Ranch in Cambria, Ca. one sunny winter day. The bird was hard to see at first because it stood dead still. 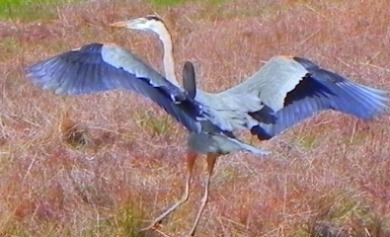 We walk on the range about once a week and every now and then we see the Great Blue Heron. We don't see them all that often but on this day it was standing on the hill watching us as we walked by. My wife noticed it first and thank God we had the camera. We got some good shots and we hope you enjoy them as much as we do. My wife and I were in awe as the giant bird took flight. We were snapping shots as fast as we could and this was the best one we could capture. The color of the bird was outstanding. The backward S curve to its long, extra long neck was incredible. We stood breathless watching it fly away hoping it would stop so we could get more shots. Suddenly, it began to slow its accent into the blue sky, its wings spread wide and it started to stop, giving us a few more moments to enjoy the sight of the Great Blue Herron. Look at the wing span on this great creature. It seemed as if the birds wings stretched out at least 6 feet maybe more. What a moment in time to stand on the beautiful beaches of Cambria, Californian watching this bird. Believe me, he was watching us as close as we were watching him/her. When you plan your visit to the Central Coast of California make time to walk the beaches and watch the birds. You might not see the Great Blue Heron but I promise you will see other beautiful birds and wild life on the coast. My wife and I always take the dogs with us on our walks. 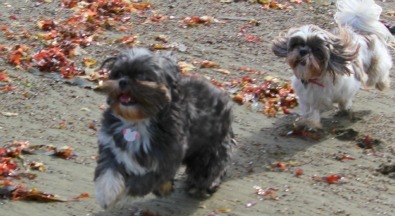 I love the way they their long Shih Tzu hair blows in the wind. No, we don't let them chase the birds. The reason I have them on this page is because I love the pictures. 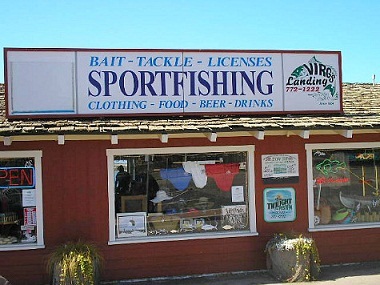 On most beaches on the Central Coast you can take your dogs if you have them on a leash. Ok, one more picture. 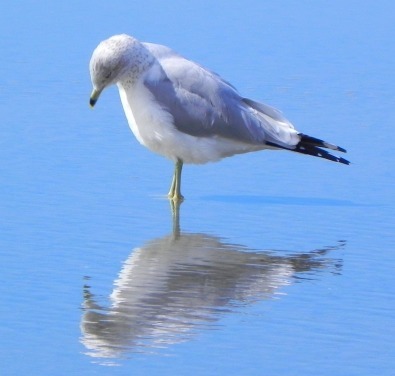 We took this picture of a Seagull looking at its reflection in the water. It was really cool. 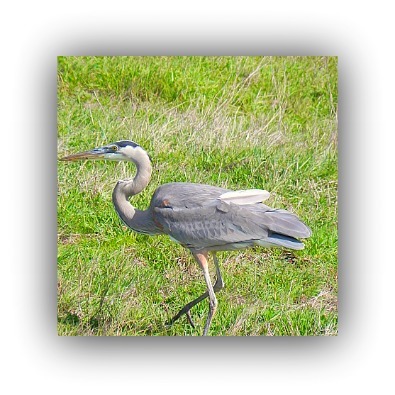 If you would like information about the Great Blue Heron click on the link.